According to the American Veterinary Dental College, it is important to brush your dog's teeth every day. It has a tremendous effect on their comfort and health. But, having a vet brush your dog's teeth can be expensive and often ineffective in the long term. That is because your dog needs to be brushed 2-7 days per week! With our dog toothbrush variety pack, you can now learn to brush your dogs teeth. Here is what you get in our triple value set. 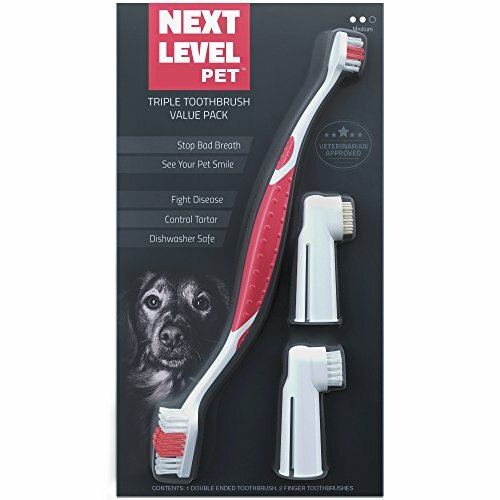 A double ended toothbrush - This comfortable brush has 2 brush sizes built in for small dogs and large dogs. It can also be used for brushing multiple dogs or front and back teeth. A super soft rubber silicone finger brush - This finger brush can be a great starting place for your dog and promotes excellent gum health with tartar removal. A medium bristle finger brush - Some pets prefer finger brushes over longer brushes. It offers extra control while maintaining your canine's health. Our recipes guide - We believe if you want to take the experience to the next level, It's best to make your own toothpaste. Store-bought toothpaste can become expensive and even contain unsafe chemicals. That's why we've created a library of tried and true pet toothpastes. A happy pet - Dog teeth cleaning isn't always on the forefront of a pet owner's mind when trying to stay healthy. We seek out quality food, routine checkups, and plenty of fitness, but dental care is just as important. Are you ready to take your pet care to the NEXT LEVEL? Just click BUY NOW to receive your pack. A VARIETY PACK FOR ALL: Three brushes and four different sets of bristles for hard to reach places. Pack includes a dog finger brush. A HAPPY, HEALTHY PUP: Promotes healthy gums for your dog, puppy, or cat. Reduce plaque and tartar buildup with the dog teeth care kit. FREE TOOTHPASTE RECIPES: Next Level Pet offers a library of highly effective toothpaste recipes for your cat or canine. FRESH BREATH: This dog toothbrush and toothpaste recipe pack gives your dog a cleaner mouth and fresh breath. If you have any questions about this product by Next Level Pet, contact us by completing and submitting the form below. If you are looking for a specif part number, please include it with your message.